Azerbaijan is celebrating National Flag Day for the fourth time on November 9. Back on November 17, 2009, this day was declared National Flag Day by a Presidential decree. Since then, Azerbaijanis all over the world have celebrated this day. The national tricolor, which is the face of the country and the most highly ranked symbol of independence, symbolizes Azerbaijani people' patriotism, aspirations, and sentiments in their continuous struggle for independence. This symbol of sovereignty has been a witness to the magnificent events of Azerbaijan's history, the hard times, and also its period of development and prosperity. The Azerbaijani Democratic Republic, the first-ever democratic republic in the Orient, which functioned in 1918-1920, adopted the current Azerbaijani tricolor as the national flag of the Democratic Republic on November 9, 1918. However, the flag was condemned to oblivion when Azerbaijan was part of the Soviet Union. 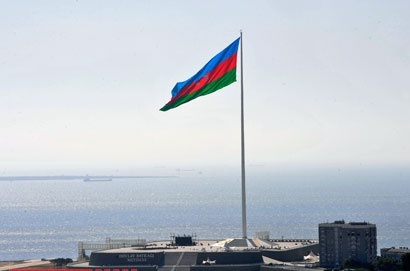 After gaining independence on October 18, 1991, this symbol of sovereignty began fluttering again as the national flag of the independent Azerbaijan. The national flag, which consists of three equal wide horizontal stripes, is not just a combination of blue, red and green colors. Each color has its own meaning. An eight-pointed star and a crescent of white color are placed in the middle of the red stripe. The first blue stripe stands for the Turkic origin of Azerbaijani people and its Turkic heritage and is connected with the idea of Turkism. The middle red stripe means building a modern society, developing democracy, modernization, and development. The third green stripe expresses affiliation to the Islamic civilization and the Islamic religion. The crescent on the flag is the symbol of the Turkic people. The eight-pointed star has two meanings, one is related to the way of writing the word "Azerbaijan" in the old alphabet, which was written with eight letters. Another meaning is connected to the principles of Mammad Amin Rasulzade, the founder of the Azerbaijan Democratic Republic: turkism, islamism, modernity, statehood, democracy, Azerbaijanism, equality, and culture. Azerbaijanis are proud of their flag and show it by waving the flag in every country they visit and live in around the world. The capital Baku has one of the tallest flags in the world: the Azerbaijani flag in the National Flag Square. This 162 meter-high flagpole measures 70 meters high and 35 meters wide and weighs 350 kg. The National Flag Museum, opened on November 9, 2010, was established under the flag pillar in the form of an eight-pointed star. The museum provides all the visitors with information about the flags, symbols, state emblems, and banknotes of states that existed in Azerbaijan's territory from the ancient times till its independence.